Over $8,000 in grants were awarded to teachers for the 2016 funding cycle. 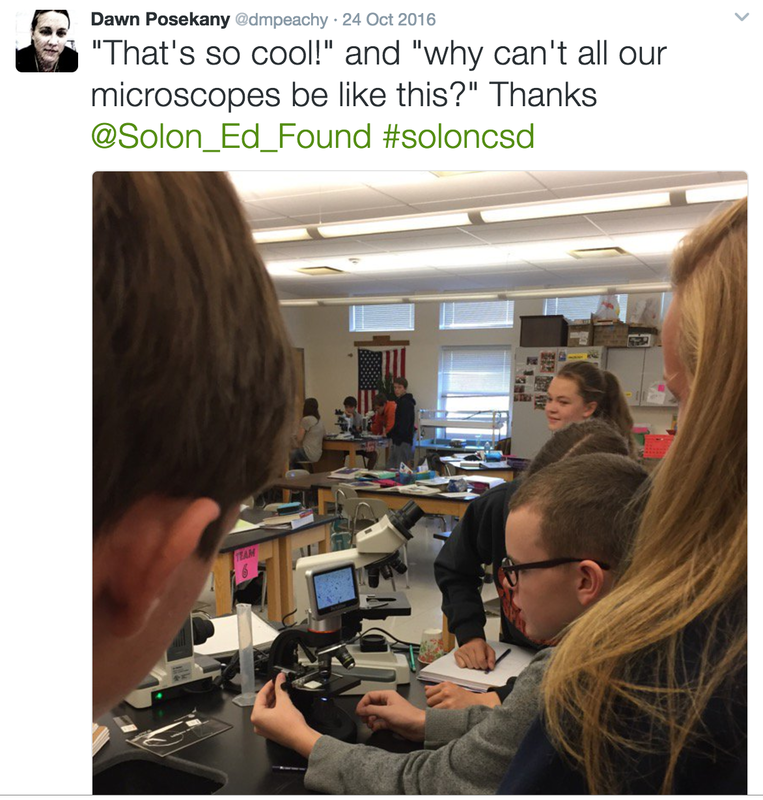 The Solon Education Foundation has awarded almost $60,000 in grants since 2003. With the new auditorium and rehearsal spaces, we would like to do more with our students in video tech and in analyzing performances. This will help us meet the National Music Standards of creating and listening/describing. With the recorder, students will be able to create music video projects, record performances, and learn to edit and mix recordings of Solon ensembles. This will help us maximize our technical offerings to coincide with our beautiful performance spaces and should be available to reach over 200 students. ​I would like to receive funding for 3 Osmo complete sets in my classroom. This school year I will have my classroom iPad, but I will also receive 3 more classroom iPads and give up 3 of my classroom laptops (they will be reshuffled amongst Lakeview). I have seen Osmos at work and was able to use one over the summer, and I truly saw how engaging they were (even for me!). Students are more engaged when they are partaking in hands-on, manipulative learning. Osmos do exactly that. They are the perfect addition to any classroom to promote and incorporate hands-on learning. The complete Osmo set includes the word, number, tangram and coding set, in addition to some other sets and accessories. The word set would provide meaningful and hands-on learning during literacy. The tanagram and number sets would continue to provide meaningful and hands-on learning during math. The coding set is perfect for an extension of technology and science that I know my students would love. Other sets would also be utilized in the classroom during choice time. 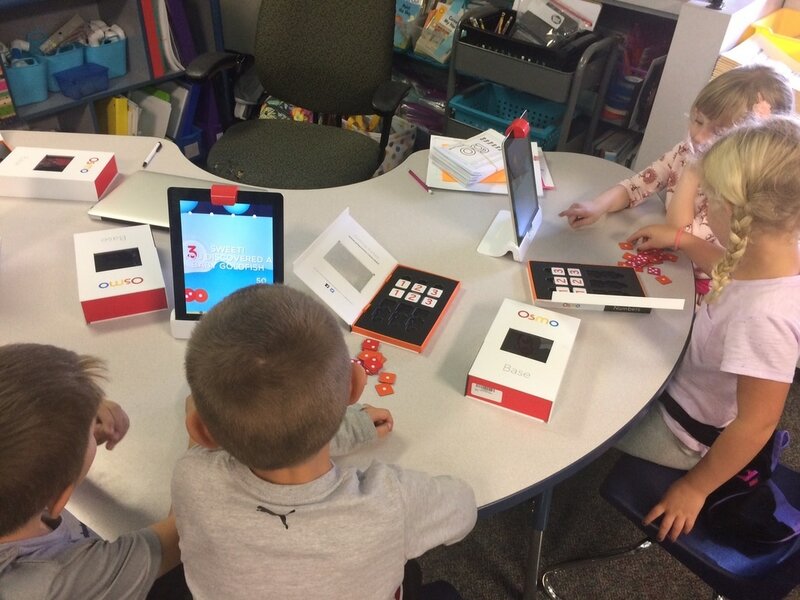 Osmo's would be used on a daily basis in my classroom, during both literacy, math and free choice rotations. Kindergarten students love to use iPads and having the Osmo sets to accompany the iPads would be extremely beneficial to student engagement and learning (they are hands-on!). The iPads would be used more as a result of having Osmo's in my kindergarten classroom. The "Document Based Question Civics Teacher Resource Binder" is organized around inquiry-based questions to address Reading and Writing Standards in the Iowa Core Standards and 21st Century Skills. All questions begin with inquiry-based questions such as, “What type of citizen does a democracy need?” The materials will have students reading primary and secondary sources while identifying point of view, bias, wrestling with different perspectives, drawing inferences and finally writing an evidence-based argument essay. In doing this, students practice thinking critically which best prepares them for post-secondary success. The fifth grade reading team, comprised of Jenny Noonan, Teresa Burg, and myself, is requesting to purchase sets of novels to use in our reading classes. We have learned over the past year that we are going to be moving away from basal reading instruction, and become novel based. We are very excited about this change, and we're working on building our library of books. We also have the wonderful Grant Wood Area Agency as a resource in which to loan books from, however we often find the choices limited and without the latest, most popular books our students are interested in. We want our students to be given the opportunity to not only read books at their appropriate level, but books that will fully engage them and allow them several exciting choices. 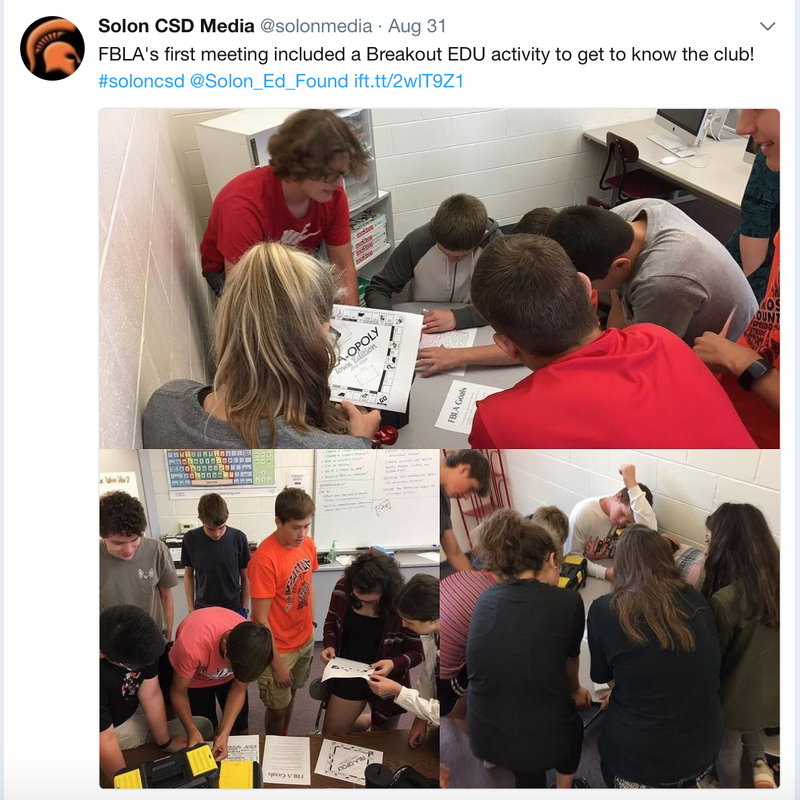 Breakout EDU (http://www.breakoutedu.com/how-it-works/) is an exciting, engaging, newly circulating gamification format of teaching in the education world. It consists of locked boxes, puzzles, locks, codes, and more to enhance and engage student learning. It challenges users to think critically and creatively, problem-solve and collaborate Not only can it be used in the classroom/media for learning experiences, it can be used for staff development and team building. The Breakout EDU kits are multifunctional, meaning that the kits can be used for any Breakout EDU game or program. 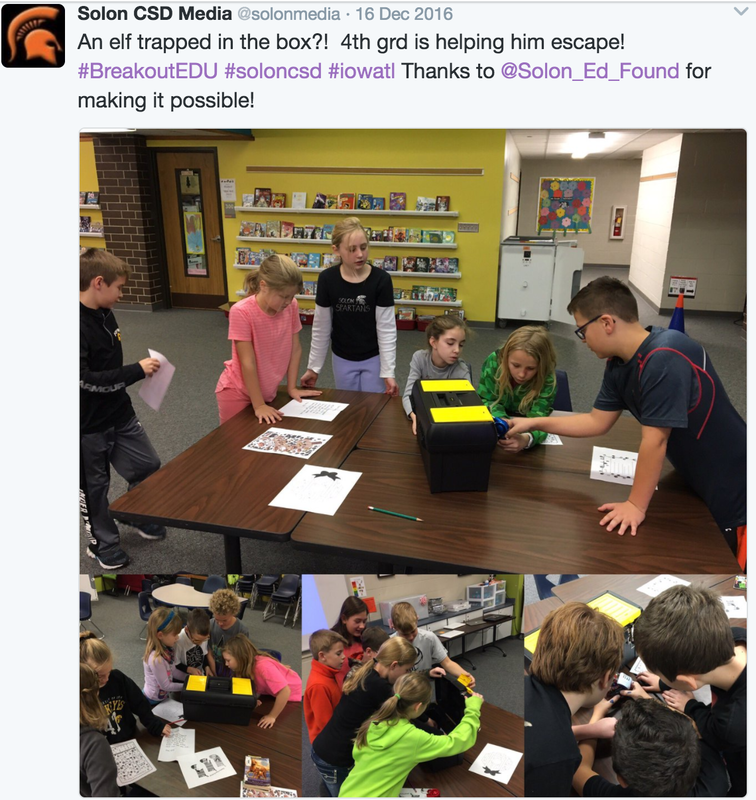 Media Services is requesting six Breakout EDU kits to allow for small groups to complete an activity. The resources that the Solon Education Foundation could help provide for my classroom would allow for all students to take home books at their reading levels to continue reading progress at home! I would be able to implement at home reading right away in correlation with our small guided reading groups in the classroom. Students will benefit immediately with at home support that maximizes their reading progress. ZooU is a social-emotional learning game for students in 2nd-5th grade. The game encourages students to learn about and practice communication, cooperation, social initiation, emotion regulation, empathy, and impulse control through animated videos. Each student goes through the game individually which is then adjusted in difficulty as they respond to various questions during the game. As a counselor, I have found students find videos and games highly engaging as well as informative. Students typically tend to ask to play the game the next time they come back and also recall the language and skills that are taught. Informative individual and group reports also make this a highly attractive option for individuals and small groups of students. MaKey MaKey is an invention kit. MaKey MaKey has recently been paired with the Scratch programming software to apply to art, engineering, and a variety of programming skills. Check out this website for some ideas that other teachers have done (http://makeymakey.com/guides/). I would like to purchase 8 of these kits at approximately $50 a piece. With the purchase of 8 kits, I can keep the number of students per group low. This will allow for cooperative learning but also give students an opportunity to get their "hands on" the device without having to sit back and watch. For the first chapter in the EDC Earth Science curriculum, Earth and Mars are compared to each other to get a better look at Earth systems and how we could duplicate those conditions on Mars. The students apply their knowledge to designing a Mars Colony and explaining their reasoning. The book and movie, The Martian, increase their curiosity and interest in creating a Mars colony and realize how difficult it is to colonize Mars. ​I would like to use the ipad pro so I could load my study guides and fill out notes as I walk around the room. This gives me the freedom to move around to touch base with each student while we are taking notes. My hope is that I can get to each student while they are filling out notes. It would also allow me to record and save my work to my website for students to refer to if they have missed a lesson or need to hear an example again. In addition to being a help to all students it would allow me share the study guide with a visually impaired student to cut back on the amount of paper we are currently using. I am requesting funds for 4 "Mini"-interfaces (LQ-MINI 4x$149 Vernier) to allow multiple student groups to measure real mechanics phenomenon, analyze their own data and learn the national standards for physics concepts. (This is the least expensive model and I am asking UNI to loan us another 4 as well). In addition, the study of circular motion found in auto racing or amusement parks involves examining relationships between force, velocity, radius and mass. However, these relationships are difficult to observe using traditional physics equipment. One common experiment involves the swinging of rubber stoppers over a student's head. This requested apparatus (CFA $449 Vernier) combines the "swinging mass" approach with high quality sensors and motor to create a system that allows students to discover these relationships empirically. Finally, I am requesting support for extra track (2x$79: ME-6960 Pasco) to extend our current set up--the extra length allows more data collection time and buffers student errors in order to better “see” overall trends in data and analyze them more clearly. ​These materials can be used by all students during their science courses and for the science fair. Using past SEF supported materials like these, our physics post-course scores have climbed to a peak of 25% higher than national average post-course scores.